On Jan 27, the Golden Rams took on Springfield College for their best meet of the season so far. West Chester scored their season high 191.850 against Springfield’s 186.500. This meet was unique because Springfield’s men’s gymnastics team was competing against Army’s men’s team, making it an extremely lively meet. At each meet, six girls are put up on each event to actually compete in the event, and the top five scores count towards the team score. Going along with the top six, exhibitions are also allowed at the meet. The exhibitionists are able to get the experience of being on the competition floor, but their score is not able to count no matter how high it may be. Exhibition is simply for practice and fun, but it is great for getting younger and inexperienced gymnasts an opportunity. 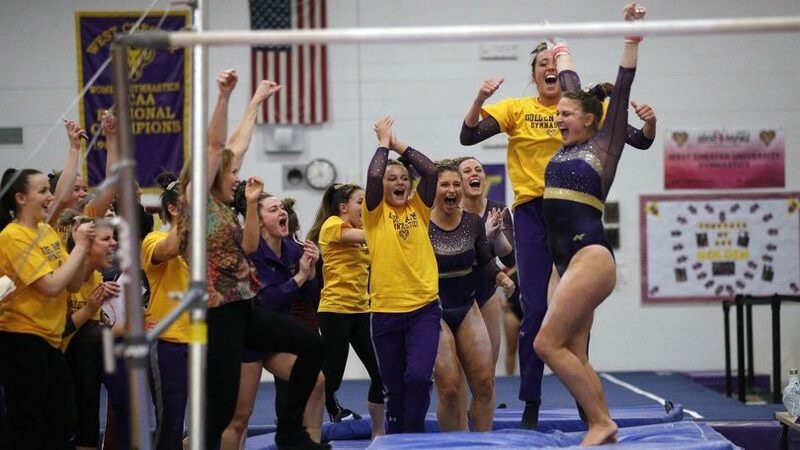 This was only a dual meet for the women’s teams, which allowed for two exhibition performances on each event. The Golden Rams started on the bars, and they had a very strong start. Third-year Jordan Miranda led off the event with an impressive season high of 9.525 while placing third in the event. Following her was second-year Jessica Meakim, scoring her season high of 9.55 while placing second on the event. Continuing the streak, third-year Natalie Onderko had her season high of 9.650 as well as fourth-year Myranda Marshall with both gymnasts placing first in the event. Fourth-year Lindsay Mathis and junior Bella D’Orazio exhibitioned the event. The team finished the event with a 47.475. The Golden Rams kept the momentum going on the vault by having their best vault rotation of the year. First-year McKenna Kissinger made her debut in the lineup starting the Golden Rams off strong. Second-year Kelley Lubking followed her with a beautiful front, scoring her season high of 9.525 tying for fourth place in the event. Mathis scored her season high of 9.550 while placing third in the event. First-year Brashlyn Johnson scored her season high of 9.650 while placing second on the event. Meakim had her season high of 9.725, while placing first on the event. First-year Sara Bell exhibitioned the event. They had their season high on the event scoring a 47.725. Continuing the rise of the scores, the Golden Rams took on the floor exercise. Fourth-year Cassie Hageman had her season high of 9.40 on the event. Following her, third-year Sarah Boyd scored her season high of 9.625 and tied for fourth in the event. Johnson followed her, tying her season high of 9.650 and placing third in the event. First-year Rose Fanara tied her season high of 9.700 while scoring second on the event. Finishing up the event, Meakim tied her season high of 9.825 while placing first in the event. Kissinger exhibitioned on the floor. The Golden Rams kept climbing, scoring a 48.2 on the event. Closing up on the Golden Rams’ strongest event, they did phenomenal. Second-year Melanie Wojewoda started off the event with her career high of 9.700 while tying for second place in the event with Miranda who also set her season high. Second-year Yoli Nodarse put up a strong 9.675 placing third in the event. Hageman also put up a strong of 9.625. To finish up the event, Boyd closed with a strong 9.750 to place first. Meakim and Johnson exhibitioned the event. The Golden Rams scored their highest event score of the day with a 48.450. The Golden Rams look forward to continuing their climb and scoring even better at their next meet.